Five degrees Celsius, 20 knot northwest wind, cold rain showers: this is typical deep winter in Amakusa. This past weekend we alleviated a bad case of cabin fever by paddling out to and around Yushima. The first challenge was getting the boats off the car - they wanted to fly away in the wind. But on the way, the rain quit, the clouds parted, and a weak sun made an appearance. Fog lifted like a veil off nearby Mt. Unzen, revealing an icing of freshly fallen snow. The beautiful view added to the good time we were already having. 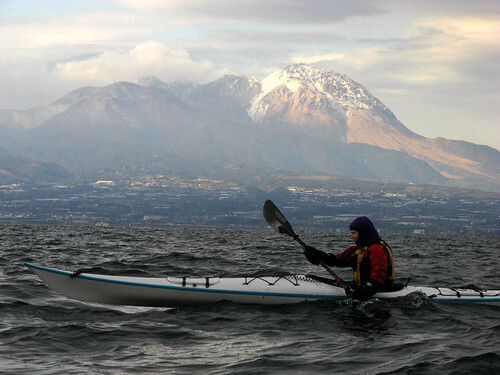 Leanne braces against the wind to make forward progress, with snowy Unzen beyond. It is a testament to the efficacy of modern clothing that we were totally comfortable in these conditions with only two to three relatively thin layers on. Then again, the Greenlanders have made do for thousands of years with seal skins and whatnot, probably in much worse conditions, too. 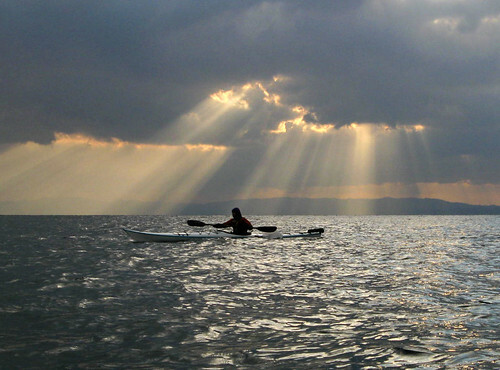 Crepuscular rays descend on Leanne as we speed along the downwind part of the route.